A new and distinct variety of Cercis Canadensis, an Eastern redbud tree found and introduced by Ray and Cindy Jackson of Jackson Nursery. 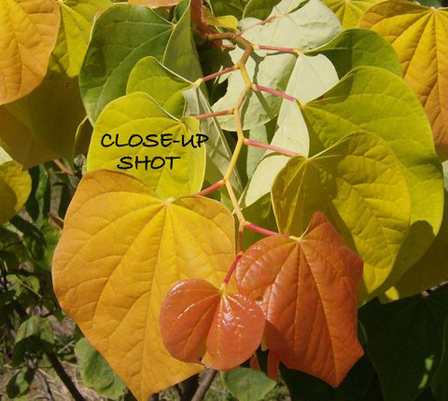 This native, heart-shaped leaf tree is a durable and rugged variety. It is heat and drought resistant and also cold hardy , and that's just the beginning! "The Rising Sun™" is a vigorous grower with full rounded shape. It almost looks as if the branches are layered. It stylishly holds its color on up into the autumn. It starts out early in the early spring with sweet-pea type flowers, rosy-orchid in color. The flowers appear before the foliage and are attractive to bees and butterflies. Then the bright golden foliage starts emerging, gorgeous! Even the bark is smooth tan with yellow-cast, distinctive from other redbuds. As the growth continues to mature you will end up with green leaves, bright green-yellowish with speckles in them and finally the new growth will be orange making this an array of colors that are to pleasing to just about everyone! It is believed to get about 12' in height. The redbud is perfect for the smaller gardens and in-town neighborhoods as well as specimen and accent planting. In 2007, the Jackson's, along with a lot of other nurseries, suffered a devastating freeze, resulting in some nurseries shutting completely down and completely going out of business. The Jackson's lost 3 1/2 million dollars worth of inventory, more or less everything they had! They received a little insurance money, only enough to keep the lights o. they were distraught, Cindy was so torn by the loss she ended up with shingles, she even wondered if they just needed to quit. She wanted a sign from GOD, something to show them they were doing the right thing by "starting over." She found "THE RISING SUN" redbud. We were looking at the tree and Ray said, "Cindy if that's not a sign from GOD that we need to stay in the nursery business, then I don't know what is!" Cindy said that was what she needed, so , they, started over! It has been a battle, but we continue to fight. "When I first saw this redbud I went wild", says enthused grower Ray Jackson! Fellow nursery-men have said it is the most outstanding golden colored redbud they have ever seen, and I can attest to it's vigorous growth and it's tolerance to not only heat and drought, but it is cold hardy too. 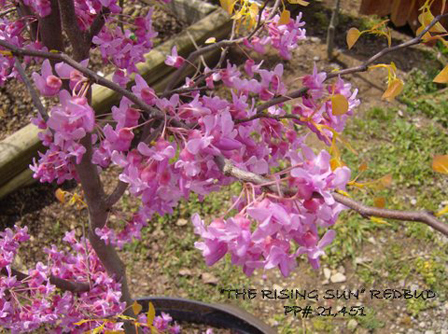 We joined up with "GREENLEAF NURSERY" In 2010 and they added "The Rising Sun™" Redbud to their "GARDEN DEBUT" Program. This plant has already been awarded "The 2012 GOLD METAL AWARD" from THE PENNSYLVANIA HORTICULTURAL SOCIETY. We have met so many people in this business, especially since we found "The Rising Sun™" It is an honor to let people know that it is going to included in, "JOURNEY THROUGH HOLLOWED GROUND PARTNERSHIP LIVING LEGACY TREE PLANTING PROGRAM". This program is planning 620,000 trees each of the fallen soldiers and some of "The Rising Sun™" will be included. Don Shadow from Shadow Nursery Winchester, TN feels that "The Rising Sun" Redbud is by far the very best of the gold leaf forms. 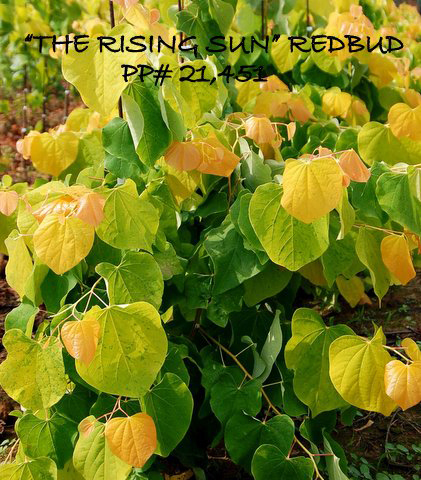 "The Rising Sun Redbud is what Garden Debut is all about. Bring new introductions with exceptional characteristics and proven performance to the gardener"
To me, it is the best self branding variety we have ever seen and the most unique in the way that it layers its array of colors all summer! Cercis Candensis "The Rising Sun", is one of the most vigorous cultivars of this species that I have seen. The new growth is a brilliant gold with just a touch of orange in our zone 8 heat. GREAT PLANT! One of the most colorful and best performing ornamental trees on the market today! Occasionally in a nursery career an exciting new plant come along that has the potential to be a "plant for the ages". The Rising Sun is clearly one of those prospects. I love this tree, a friend got one for me a couple of years ago and iy wss beautiful but since I sold my condo and had to leave it behind.. I would love another, please tell me where I could purchase one in the Knoxville area or if you would sell me another or 2 of them.